To most visitors who rarely venture further out, most of Labrador's beach would seem to be comprised of either seagrass lagoon or ugly grey rocks/rubble. 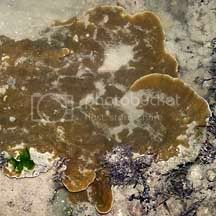 But sometimes at the super low tides, the corals further away from the shore are exposed. Labrador's beach slopes at a gradient, so lower tides means a much larger area of the intertidal is exposed. This post was a long time in the making, and a few people must be credited for their invaluable help despite being terribly busy people with other things to do. Firstly, Ria Tan of WildSingapore, who has been graciously sharing her lovely photos. Also the coral "gurus" of the NUS Marine Biology Lab for helping with the tricky IDs - Jani, TL and Z. The answer? A bit of all 3! Or at least the hard corals are anyway. 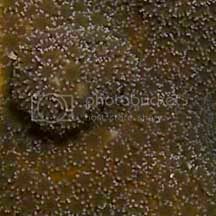 The picture above shows a hard coral, Goniopora sp..
You can see some of the polyps sticking out (those are the fuzzy bits that look like flowers). That's the animal part. 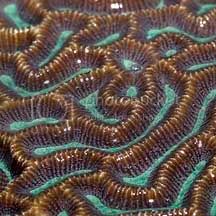 Corals are very simple animals, kind of like inverted jellyfish, which are essentially bags of water. Since they both have stinging cells, they are grouped together under the phylum Cnidaria, which comes from the greek word "cnidos", meaning stinging nettle. 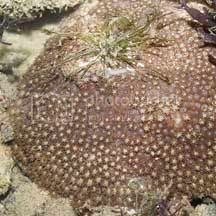 Each polyp is an individual, but most clone themselves to form a colony (ending up with the big structure you see on the beach). 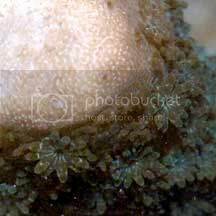 Some hard corals, like the mushroom corals, consist of one individual polyp. 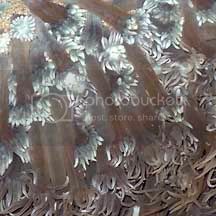 Coral polyps are actually transparent, so why are there so many colours and forms? Two different types of Psammocora. 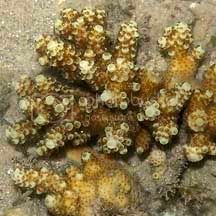 Many tiny symbiotic algae called zooxanthellae live in the tissues of coral polyps and are responsible for giving the corals their distinctive colour. 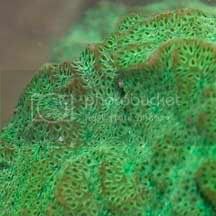 In return for living space, they photosynthesise and serve as an energy source for their coral hosts. That's the vegetable part! 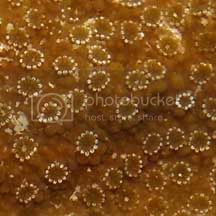 Hard corals also secrete a skeleton of calcium carbonate - mineral! 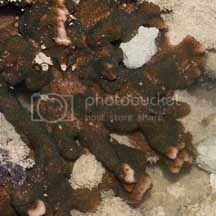 That's what fills the space between individual polyps, and also what coral reefs are made of. The polyps live in holes in the skeleton. 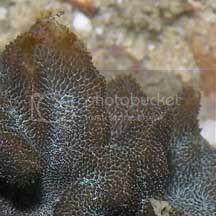 New polyps can grow on top of old dead skeleton and this is how corals "grow". Corals are quite hard to tell apart. They need to be cut up and stared at under the microscope. 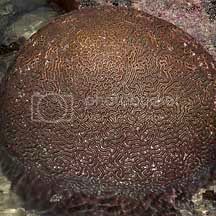 But there are some general shapes that can be use to describe corals. 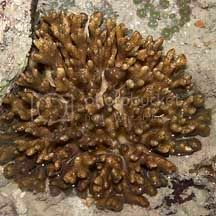 The most commonly seen type of Acropora is the branching form (as opposed to the Goniopora shown above that is round and kind of boulder-like). 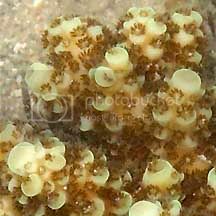 It's quite distinctive since the corallites (the skeleton of an individual polyp) are cup-shaped. 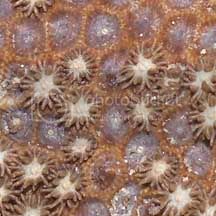 The long-tentacled Goniopora is also quite distinct. The polyps retract into the skeleton when you touch them. I always wonder where it all fits. Here's where the confusing part sets in. Most genera have many different forms. 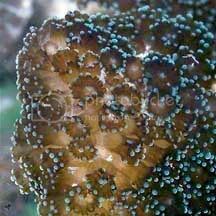 Corals are really important to the animals that live in, on and around them. 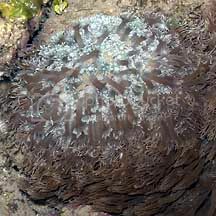 They form reefs that become a unique ecosystem, providing a habitat for many marine animals (fish, crabs, shrimp, echinoderms, slugs, worms, the list goes on). Think of the trees of a rainforest. Like trees, they take a really long time to grow. So the next time you walk on the intertidal, do look out for these beautiful creatures, feel free to take photographs, but treat them with care. And please do not take them home!